Magnetic Separator, Metal Detector and Magnet specialists, Bunting Magnetics Europe Ltd has been announced as the headline sponsor for the first stage of a gruelling challenge that aims to raise much needed funds for Tŷ Hafan, a children’s hospice charity based in South Wales. Bunting Magnetics specialise in providing metal separation and magnet-based solutions and have their European manufacturing headquarters based in Berkhamsted in Hertfordshire, UK. Between the 5th and 7th July 2018, a group of 13 men will climb five UK mountains in 55 hours, to raise funds for Tŷ Hafan, the children’s hospice in Wales, where life limited children and their families are offered specialist care and support to help them make the most of the time they have left together and create and cherish a lifetime of memories. Bunting will sponsor Ben Nevis – the first mountain that the group will tackle. They’ll go on to scale Scafell Pike in England, then Snowdon, Cadair Idris and Pen y Fan in Wales, all within 55 hours, including travel time. Quite a feat, admittedly, but not that unusual – lots of plucky people set themselves incredible challenges in the name of charity. But these are no ordinary men. Between them, they share a special, bitter-sweet bond that most people will never have – they’re all part of a family with children who have life-limiting conditions. They belong to the Tŷ Hafan Dads’ group – a support network that formed back in 2008 for fathers of children who have used Tŷ Hafan now or in the past. The group enables dads to meet others in the same situation, helping them share their worries and fears about having a child with a life-limiting condition. Bunting became involved when Paul Fears, their Press Office and Photographer, announced that he was taking on the #5in55 challenge. Paul and his family have received many years of support from Tŷ Hafan since his eldest son, Greg, was diagnosed with a life-limiting condition. 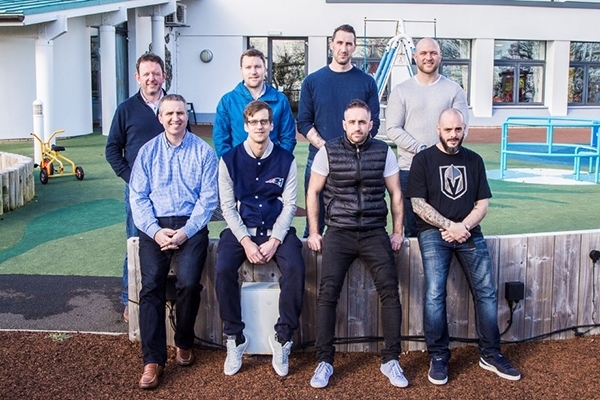 “Paul talked to us about the challenge and explained that this group of Dads just wanted to do something to promote Tŷ Hafan and thank the staff and care team” said Simon Ayling, Bunting’s Managing Director. “Walking up five mountains in 55 hours was considered to be tough enough to be a real challenge but is nothing compared to the daily challenges faced by the families and children who are supported by Tŷ Hafan. Immediately, we wanted to support them and asked to sponsor the climb to the top of the UK’s highest mountain, Ben Nevis”, he added. Family Support Practitioner, Gareth Jenkins, runs the Dads’ Group at Tŷ Hafan and will be joining them on the challenge.